This post is part of an ongoing series related to how I use Adobe Photoshop Lightroom. If you haven’t read them yet, check out How I use Lightroom: Getting Photos In and How I use Lightroom: Taking Out the Trash. One of the first hurdles users new to Lightroom run into is how to get to the images they have edited. It’s common to think I imported them to the My Pictures folder, so I’ll just use Windows Explorer to grab a copy. Lightroom allows you to edit photos non-destructively, which is a fancy way of saying you are never changing the original image file. Every single edit you do to the image is saved in the Lightroom database (the catalog) as nothing more than an instruction. When you view the image in Lightroom, the software simply replays these instructions to reconstruct your final, edited photo. If you were to copy the file from the hard drive, it would be the image exactly as it was copied from your memory card. Aside from not being able to just copy the edited photo from your library folder, this is all done completely transparently. This brings us to Exporting. To get your final, edited photo out of Lightroom for use elsewhere you must first Export. Just as when viewing the photos in the software itself, Lightroom takes the original image and applies all of your editing instructions to produce the final one. One of the ways to start an export is to click the Export… button at the bottom of the left sidebar. There are many ways to start an Export, this was the simplest to get a screenshot of. This brings up the big Export window where you can control every aspect of how the output image is generated. The all powerful Export window. Click to enlarge and follow along. All of these settings can be saved as Presets, which appear on the left of the window underneath User Presets. As you can see, I have a number of them. My Export Presets. Some are used all the time, others only rarely. Ana’s Picture Frame This one re-sizes photos and increases the JPG compression so they are ideal for a digital photo frame in Ana’s office. Digital Picture Frame re-sizes and increases compression so the images are suitable for my digital picture frame. Downloads (w:) exports a 1024px wide image to a location reachable via a private URL for quick/temporary sharing with others. For Blog re-sizes to 500px wide with a reduced JPG quality for use on this blog. Lower JPG quality result in smaller files which download quicker. Full Size does a straight export without any resizing or sharpening. I use this if I want to give the full image to someone. iPhone Wallpapers re-sizes to 960×326, suitable for iPhones. Twitter uses a plug-in to re-size and upload the image to.. you guessed it, my Twitter account. 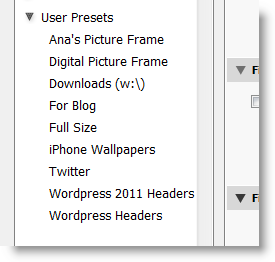 WordPress 2011 Headers renames the image to header_###.jpg, re-sizes it to 1000×288, and reduces the JPG quality to 70 for speed. These are used in the Twenty Eleven WordPress theme used on the blog today. WordPress Headers does similar to the previous one, but with different dimensions suitable to the old theme I used on this blog. I’ll be deleting this one soon. When you go to export, you basically work top-down in the window until you’re happy with the settings. Clicking Export starts the process. Right now I’ll quickly go through each of the major sections I use. 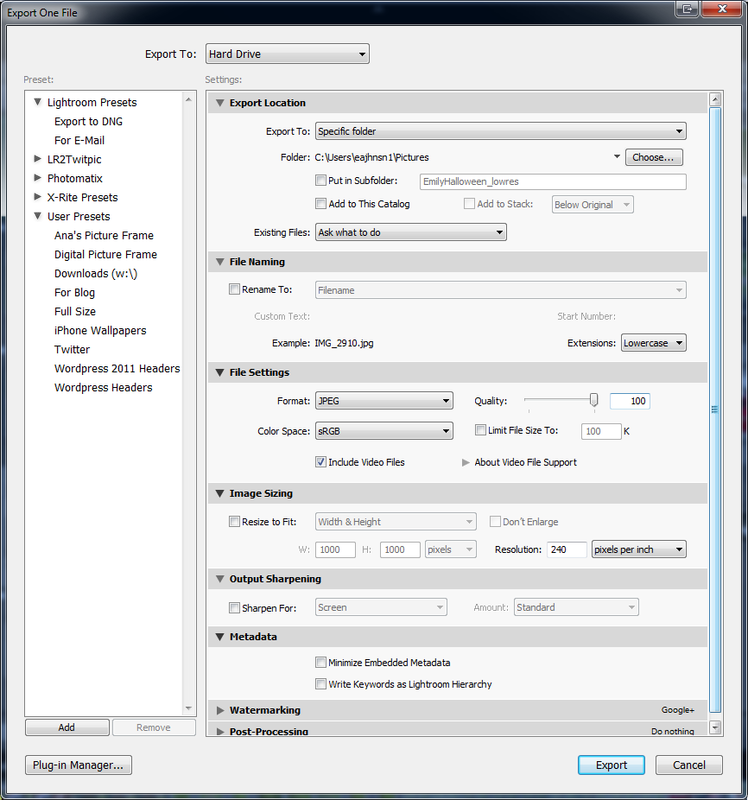 Refer to the Export Window screenshot included above and follow along. This option at the top of the window is to select between things like Hard Drive, CD/DVD, and any number of Lightroom plugins you may have installed. I’ll touch on plugins in a while, but will say for now that I have options for Twitter, Shutterfly, SmugMug and Picasa here. These are the settings for exporting WordPress Headers. Notice the Subfolder used for organization. Click to enlarge. This is self explanatory, it’s where you want the newly created files to be saved. I recommend never pointing this to a directory that you have told Lightroom to import photos to, because you’ll just end up being confused. Most of the presets I have each export to a different folder in my Windows Pictures folder. For instance, the For Blog preset exports to a folder named ForBlog. This way I can select any number of files, tell them to export with a preset, and go to that folder to quickly locate them. If I’m uploading a set of files, I often will give them a somewhat descriptive name here. I have a renaming presets setup to name the files like “Park 03.jpg”. When I mentioned above about changing the JPG quality, this is where it’s done. If the image is going on the web, particularly re-sized, I’ll just choose 70 for the quality setting. This lets Lightroom perform more compression and it’ll still come out looking good. Be sure to select the medium the images will be viewed on. This is surprisingly very important if you are exporting photos you are then going to turn around and get printed. I have a post on this if you’re curious. This is how I add a small, visible copyright to the lower right-hand corner of certain images – typically when uploading to Facebook and Google+. You can create presets for how the watermarks appear and they can be re-used later. ColorChecker Passport for color calibration via the X-Rite ColorChecker Passport system. Export to Photomatix for processing HDR photos in Photomatix. Facebook (built-in) for uploading directly to Facebook. jf PicasaWeb for uploading to Google+ albums. Shutterfly Upload for, you get it. LR2Twitpic for the rare uploads directly to my twitter account. If you’re looking for a plugin for exporting to your favorite site, you should check out Jeffrey Friedl’s site first. He writes quality plugins that work, and work well. As you can see here, using its extensive export capabilities I am able to use Lightroom as the central hub for my photos and just push image copies to where they need to go. When Google+ came along recently, it was just minutes for me to install the jf PicasaWeb plugin and start uploading. Thanks for reading, the next post will probably take a closer look at organizing using Collections. Please come again!